BLACKJACK TOURNAMENT E-BOOKS BY BJI AUTHOR KEN SMITH! How to Win EVEN MORE Blackjack Tournaments - Volume II... only $14.95. Ken Smith's second e-book on tournament blackjack contains more of his winning strategies that have made him one of the best tournament blackjack players in the world. Or, purchase both Volume I and Volume II together for $24.95... over 15% off! NEW! Read how Ken used skill to win a recent blackjack tournament. Get his books and you could too! The true story of how a low stakes player beats the casino!. You've read Barfarkel's articles in BJI, now get the book about his wild experiences as an advantage blackjack player. We are pleased to have Vinny DeCarlo contribute his extensive expertise and experience to the Blackjack Insider. DeCarlo's first article is a primer on casino currency reporting regulations, something that high stakes blackjack players should be aware of. Ralph Stricker continues his story of how he got into playing and teaching blackjack, this time describing an interesting experience he and his team had at an Aruba casino ("the trip from heaven"). In his series on shuffle tracking, Mark Billings decribes how to determine at home if the shuffle you saw at your favorite casino is trackable. JPB made two trips to the Biloxi casinos and reports on the blackjack playing conditions that he found (including one casino that he rates as "one of the top 10 casinos in the county for virtually every blackjack player"). Frank Scoblete describes the infamous single-deck blackjack game at the old Maxim casino in Las Vegas, and his team of reporters provide the latest news on the blackjack (and craps) playing conditions in the Atlantic City casinos. Sometimes you lose at blackjack when you have the edge; Alan Krigman explains why. Joe Pane reveals who the top 10 tournament players are based on the survey results from BJI subscribers and tournament players (some of the winners may surprise you). Kenneth Smith describes the last three hands of a recent tournament that he played, an excellent primer for beginners who need to learn how to bet on those crucial last hands. You can get the monetary edge when you play craps and Jerry "Stickman" provides the details on how to do it. Many players who play poker online make silly mistakes that doom them to lose; Bill Burton explains what these mistakes are and how to avoid them. Lastly, we have a summary of major blackjack tournaments courtesy of blackjacktournaments.com. If you come across an unfamiliar blackjack term in one of our articles or reports, see our Blackjack Glossary: www.bjinsider.com/questions_glossary.shtml. Did you know we have all past newsletter issues available in our archives, with online search? E-mail subscribers can also read each month's issue online at our web site: BJI Issue #115, August 2009. Do you have to be a Math Whiz to win at blackjack? Try the software out for free! Last year, the movie 21, featuring Kevin Spacey and Lawrence Fishburne, opened in theaters around the country. Join the ranks of savvy blackjack players who get the edge over the casino, without the need to be a mathematical genious and months of training! These software bundles contain absolutely everything you need to become an expert card counter, with a focused training regime including pass/fail exercises so you know when you are ready to hit the casinos. Learn to correctly determine poker pot odds, and make the best decisions at every betting opportunity. Use the incredibly fast and powerful poker calculator that tells you the winning probabilities and odds for any combination of known and unknown hands and/or board (just like on TV). Use the powerful poker system editor that lets you select from supplied pre-flop decision methodologies by popular authors and experts, as well as edit or create your own systems. View the Outs table to quickly find single card outs probabilities and pot odds with one or two cards to go. Find out if you can control the dice at craps. Prove whether your dice control skill is working, and what edge you can get. Includes the Smart Craps simulator, Roll Recorder for Windows and Palm OS, dice set optimizer, advanced betting module, and much more. More discounts for Palm OS and Pocket PC versions as well: http://www.deepnettech.com/specials1.html. PLUS... Get a copy of Henry Tamburin's print book, Blackjack - Take the Money and Run, and a copy of his VHS blackjack training video, "Blackjack - Deal Me In! "video, mailed to you free! Free copy of Henry Tamburin's VHS blackjack training video, Blackjack - Deal me in. Henry Tamburin has packed his 25 years of blackjack experience into a 90 minute VHS video program designed to help you play like an expert. This book is mailed to you for free (not downloaded). Note: only mailed to continental US addresses, by standard US mail (this book not included outside of the US. Allow 2 weeks for delivery). Normally $19.95... yours free (no extra charge for shipping)! Free copy of Tamburin's Blackjack - Take the Money and Run: This perennial favorite has been a great introduction to advantage blackjack play and card counting for many years. This book is mailed to you for free (not downloaded). Note: only mailed to continental US addresses, by standard US mail (this book not included outside of the US. Allow 2 weeks for delivery). Normally $14.50... yours free (no extra charge for shipping)! Free 3-month subscription to Casino Player Magazine, mailed right to your doorstep! That's three free issues to Casino Player, the #1 best selling magazine for gaming enthusiasts. Normally $27.95 per year. Free 3-month subscription to Midwest Gaming and Travel Magazine, mailed right to your doorstep! That's three free issues of the #1 magazine that covers gaming (and attractions) in the Midwest. Normally $30 per year..
Free 3-month Membership to BJ21.com Green Chip Forum: The Green Chip Forum at www.BJ21.com is the best paid private gaming forum on the Internet! You'll find no better online group of experts discussing blackjack, craps, poker and all advantage games. For all the details, click here. Normally $14.75... yours free! Free copy of Blackjack Mentor for Windows blackjack training software: Master blackjack strategy and maximize your win potential over the casino. Normally $15. Free copy of Best of Blackjack Insider e-book: 40 articles by 15 of our best BJI authors, all collected into one easy-to-read Adobe Acrobat PDF file. Download available after purchase. Normally $19.95. 3 free monthly e-mailed issues of the Las Vegas Advisor e-newsletter. Since 1983, the LVA has been the premier publication for information on the best deals Las Vegas has to offer in dining, entertainment, gaming, rooms, and shows including Curtis' legendary monthly list of Top Ten Las Vegas Values. The LVA also keeps up with new casino openings, new condo developments, and anything else happening in Sin City. $10 value. Great members-only articles: When you purchase an annual membership for $19.95 (US), you get access to ALL articles in 12 consecutive monthly issues of Blackjack Insider, delivered to your e-mail box. Find out what you're missing in over 1/2 of the articles each month! NEW articles every month by leading experts: While other sites reprint boring articles, we PAY our authors to generate exciting new content on a range of topics, including current casino conditions, gambling strategies, and much more. A portion of every membership fee goes to pay our authors for their great articles. No more web site top/side banner ads: When you buy a membership, you get a user id and password to enter and read the members-only articles. Entering and saving this uid/pwd removes the web ads for you! Current casino condition reports: Every month we publish articles on the best casino games in Las Vegas, Atlanta City, and elsewhere. Learn not only the best games available, but the best deals and promotions! Get Access to 700+ prior articles! : Your membership includes access to our complete archive of back issues going back many years. Over 700 articles for you to read whenever you want. For 18 cents an article!! At 20 bucks a year, that's about what you're paying for our quality articles and reports by leading experts. Find out what you've been missing in all the members-only articles every month. BJI Membership for $19.95, with over $100 in Free Gifts! NOTE: This offer not valid for Blackjack Insider renewals (new subscribers only). If you are a current subscriber and use this offer, you will receive a new user id and password active for one year from now and your old account will expire normally. This offer valid once per customer/e-mail address. The promotional items above may not be provided to existing users of the respective services (i.e. existing Green Chip members or Casino Player subscribers). August 14 - 16... not too late to sign-up! $100 off the normal rate! The movie 21 released last year shows the glitz and glamour of card counters beating the casinos for millions. 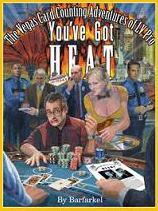 But is card counting really all glitz and glamour as portrayed in the movie? Not quite. In fact Barfarkel, a blue-collar, low-stakes counter, offers a real-life look into what it's like to be in the trenches beating the casinos at their own game. His first book, You've Got Heat, was an instant success and sold out. 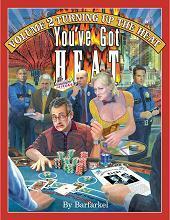 We have republished the book as a downloadable e-book, and also published his second e-book, You've Got Heat Vol 2: Turning Up the Heat. The latter book also contains a unique article written by Barfarkel based on his experiences with the world's oldest profession. According to Barfakel: "As a single man who enjoys a good time, I've availed myself to the occasional pleasures of women of the night in Las Vegas. There are a lot of people who have no idea how one goes about buying the services of a prostitute. Whether they ever want to try it or not, inquiring minds want to know! So here it is... the ins and outs of prostitution in Las Vegas. Pun intended." Barfakel's book has received glowing reviews from a host of industry experts including Stanford Wong, Anthony Curtis, Don Schlesinger, Max Rubin, Kevin Blackwood, Viktor Nacht, Eliot Jacobson, Ralph Stricker, Parker, LVBear, Howard Schwartz and Michael Konik (read their reviews at www.youvegotheat.com/book_reviews-html). You've Got Heat (Vol. 1):The Vegas Card Counting Adventures of LV Pro . 231 pages. Covers 26 trips made by Barfarkel to Vegas and Reno from 1999 to 2003. $15.00. Note: If you're anxious about ordering an e-book, read the following. Our e-books are produced in an electronic format. Nothing is shipped to you. Your e-book is available immediately after you complete your purchase (you simply click a link and download the book to your computer). You can read the book on your computer screen or print it. If you ever have a problem with the download, there is plenty of technical help available. You also save money because there is no shipping & handling charge. The process is quick and easy. Legends of Blackjack: True Stories of Players Who Crushed the Casinos, is a great new e-book by BJI author Kevin Blackwood and Larry Barker. Read the true stories of the legendary players and teams who won millions of dollars in casinos throughout the world. $14.95 for the e-book, available immediately after purchasing. Our Blackjack Tournament Pro and BJI columnist Kenneth R. Smith has written his first book, How to Win More Blackjack Tournaments, which summarizes the blackjack tournament strategies contained in his articles from Blackjack Insider (plus three new articles not available anywhere else!). $14.95 for the e-book, available immediately after purchasing. "Due to the government's war on drugs, the government seems to think that anyone with $10,000 or more is in to some kind of crooked activity. This fear alone required banks, and now casinos, to report any and everyone that has or completes any transaction over $10,000. Here's how this works..."
"After the debacle with the Las Vegas team, I had to decide about continued team play. Steve N., Sally H., and Bobby F. were undecided about continuing full time team play. I had to start thinking of my own future, especially how I wanted to continue in the game of blackjack, and what was financially the best way for me to continue..."
"I made two recent trips to the Biloxi, Mississippi area. I was really looking forward to playing double-deck games with favorable conditions ... unfortunately, I was reminded that the base rules/house advantage is not as important as penetration and casino heat..."
"Frank describes the greatest blackjack game that he ever played, and his team of reporters provides updated playing conditions including some deep-penetration games at Trump Plaza..."
"Most players normally don't gamble enough, especially at the tables, for the law of averages to take hold. In most cases, the issue for bettors is whether they're doomed to lose because of the casino's edge. Less often, for advantage players such as card counters at blackjack, the question is whether they're guaranteed to succeed because of their edge over the house. The answers in both instances involve the relationship between edge and volatility..."
"And the winners of the who are the top 10 tournament players survey are..."
"I recently played in a mini-tournament in Biloxi and found my final three hands to be interesting for an unusual reason. I felt like I was effectively playing on auto-pilot. I think that any skilled player would have made exactly the same bets that I made and played the hands in exactly the same way. In this back-to-basics article, I'll show you the situation and let you play along with me..."
DICE CONTROL: HOW TO GET THE MONETARY EDGE OVER THE CASINO by Jerry "Stickman"
"Comps are used to make casino gamblers want to be recognized, loved and appreciated. The red-chip players look at the comps of the green-chip players and are envious. The green-chip players look at the black-chip players and are envious. The black-chip players look at the purple-chip players who are looking at the orange-chip players who are looking at the gold-chip players who are looking at the brown-chip players who are looking at Kerry Packer, who was treated like a god - and everyone wishes to be worshipped like that..."
"Although there is a certain amount of luck involved in poker, the skilled player will win out in the long run. The skilled poker player is the one who makes the fewest mistakes. In poker you will win more money from your opponent's mistakes, than you will from your own "fancy play." Conversely, you will lose more money if you are the one making the mistakes. Players make mistakes, whether they are playing online or live in a card room; however, there are some mistakes that are more prevalent in online play. Here are four common online poker mistakes..."
"Check out the schedule of major blackjack tournaments in August and September by region in our Blackjack Tournament Report courtesy of blackjacktournaments.com..."
Read the complete tournament schedule. ©2015, DeepNet Technologies. No material to be copied without express permission of DeepNet Technologies. This site developed by DeepNet Technologies, Ontario, Canada. Contact webmaster @ bjinsider . com if you have problems. This site is best viewed in a 800x600 graphics mode, or higher.